Today, Governor Haslam met with UT Martin Chancellor Tom Rakes and members of his staff to discuss the unique role UT Martin serves within the West Tennessee region and state. 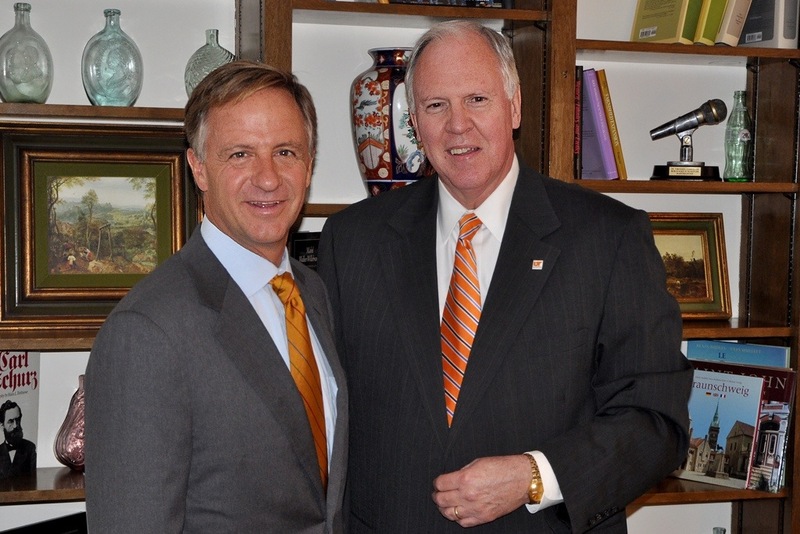 Haslam’s visit is part of an ongoing dialogue held across the state concerning higher education and workforce development. Chancellor Rakes noted that UT Martin has the second highest graduation rates in the state among all public colleges and universities. He further noted that 52% of all UT Martin’s entering freshmen are Pell Grant recipients. The Governor was noticeably impressed with the campus’ achievements in this area and asked staff to expand on various measures undertaken to achieve this outcome. A lengthy discussion ensued on how to increase the participation and success rates in STEM majors. Although no specific policy proposals were discussed, the Governor noted that he is continuing to gather information on the successes and needs of public higher education institutions and their ability to foster a more competitive workforce for the state.